11:00 a.m. to 2:30 p.m., 5:00 p.m. to 11:00 p.m. When almost all of your neighboring restaurants already serve Chinese, you don’t open another one. Especially in Banawe. This is what chef Zaza Sarmiento, owner of 13 Ubay St. Comfort Dining, kept in mind when she re-launched the restaurant’s new menu. Now, she gears up towards something she knows best—Filipino comfort food. “My mom was the one who directed me to that direction. She said that since this is our family house, why not serve customers what we used to eat during our family parties—what your cousins, aunts, and uncles look for when they go here?” says Sarmiento. Before 13 Ubay, the house used to be the home of Sarmiento’s maternal grandparents and their printing press business, which was transferred to Valenzuela. The restaurant opened in 2015 and previously served international dishes. ABS-CBN soap opera Pangako Sa ’Yo (2015) used to shoot here. This was Kathryn Bernardo’s restaurant. 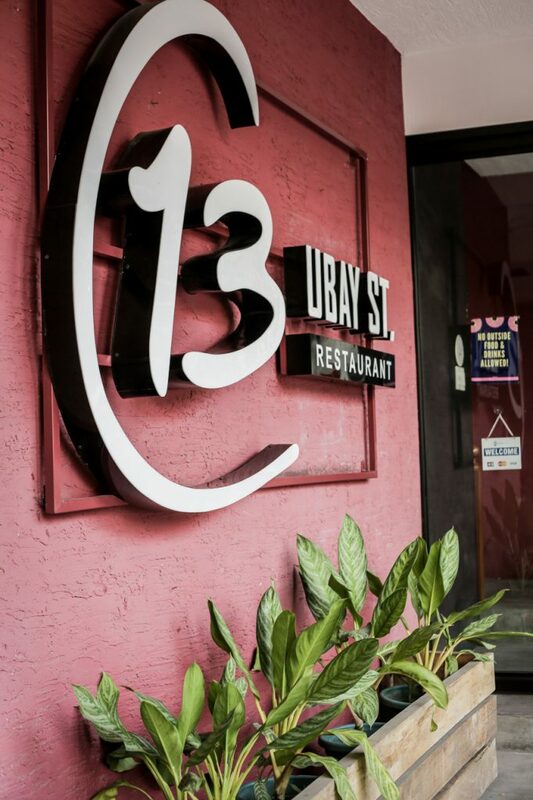 13 Ubay’s old menu consisted of international dishes inspired by travels as well as her experiences while working for a global hospitality company in Curacao. “Some of the dishes in the old menu were out of this world,” says Sarmiento. The “right direction” isn’t very far from what Sarmiento wants to do—thank heavens— which is to share. Here’s what their new menu has to offer. 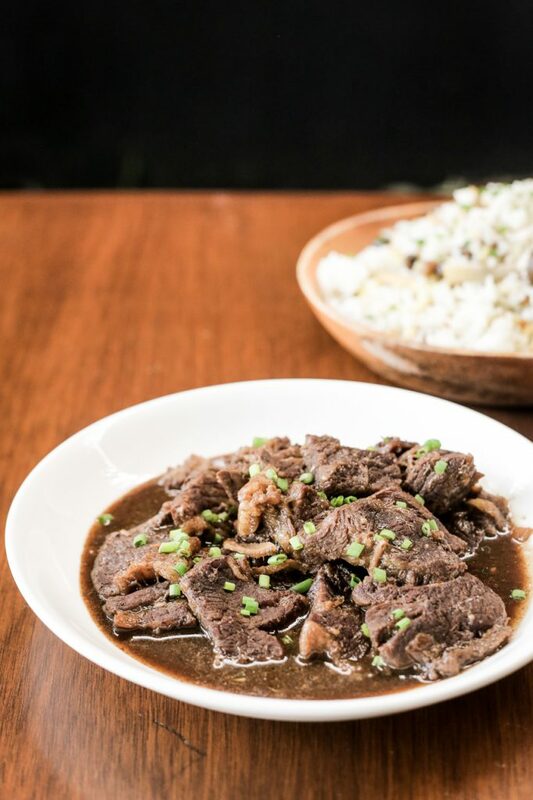 What makes this dish of stewed, tender brisket swimming in pares sauce comforting is its homemade chili garlic oil. Slices of pears are pierced in between wraps of meat to break the savory flavor and give this dish a little sweetness. “This pares transports me back to my childhood where my uncle would bring us to Retiro for some pares,” muses Sarmiento. Of course, her version isn’t exactly what you’d get in Retiro. It’s more peppery and has a hint of spice because of their homemade chili oil. 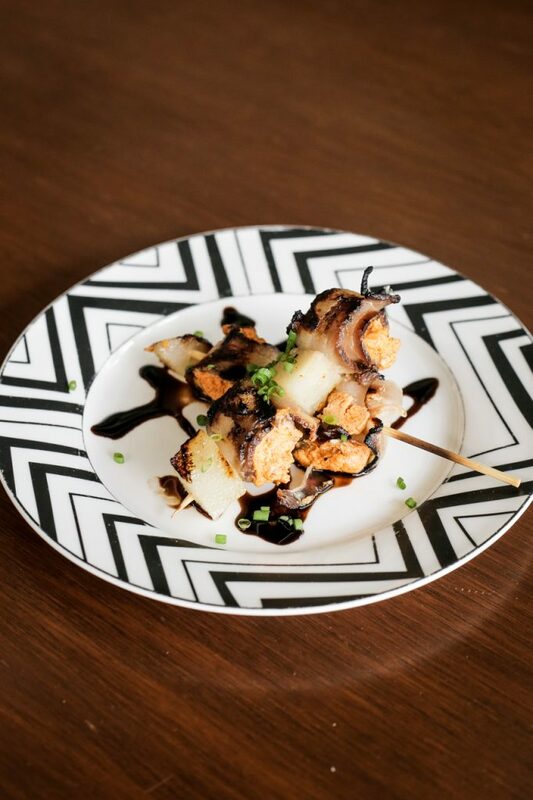 The skewered treats are a mix of cheeses and secret spices wrapped in homemade bacon. This cured pork meat actually comes from another brand created by Sarmiento, which she named after her grandfather, Lolo Joe. “Our [Lolo Joe’s] bacon has no MSG and chemical preservatives,” she proudly says. 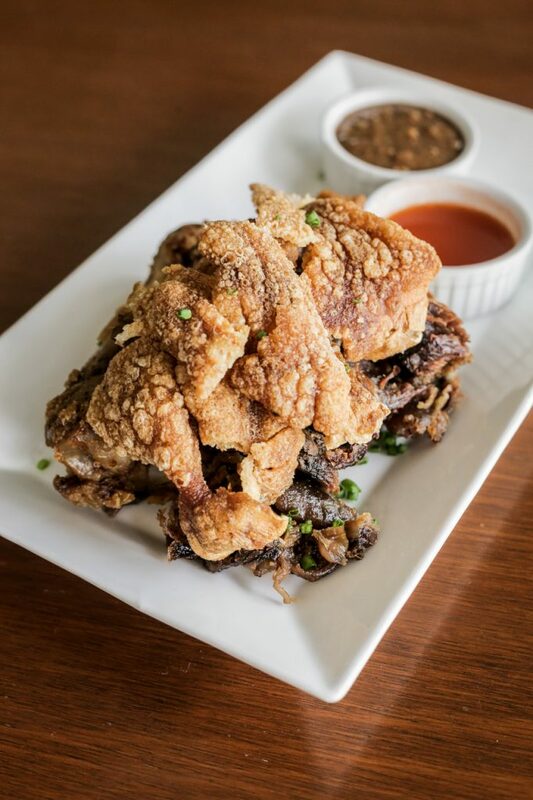 The food you’re cheating on your diet with better be good like this crispy pata with sinful chicharon-like skin. 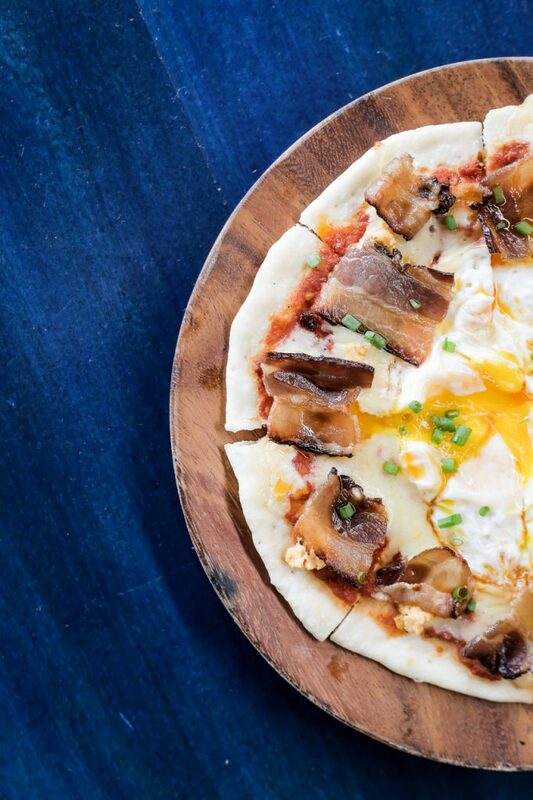 What more could be comforting than this crunchy pizza snuggling chops of their artisanal bacon and a gooey sunny-side up fried egg in the middle? During her childhood, Sarmiento could tell if a day was special if a crispy pata was on their table. This is one of the dishes she shared with us—a sinful mass of tender pork protected by crunchy, chicharon-like skin. 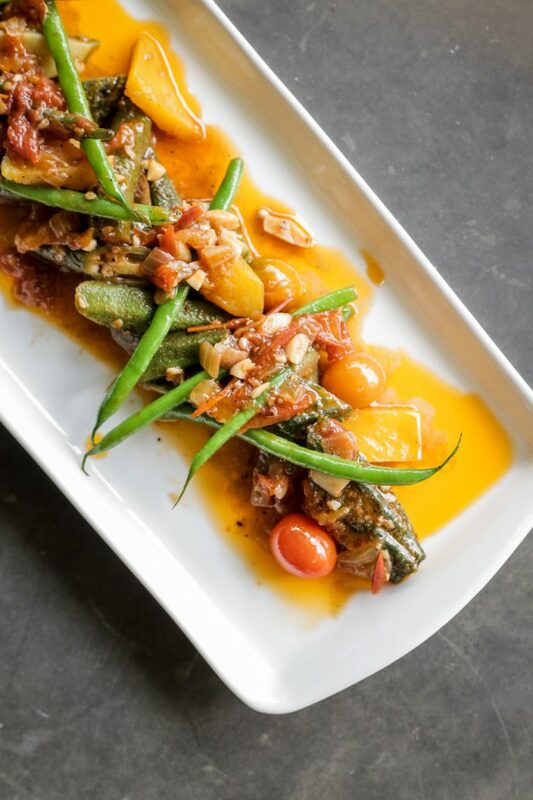 The recipe for this pinakbet is originally from Sarmiento’s paternal grandmother who hails from Ilocos. For this particular dish though, she used baby vegetables for more crisp. 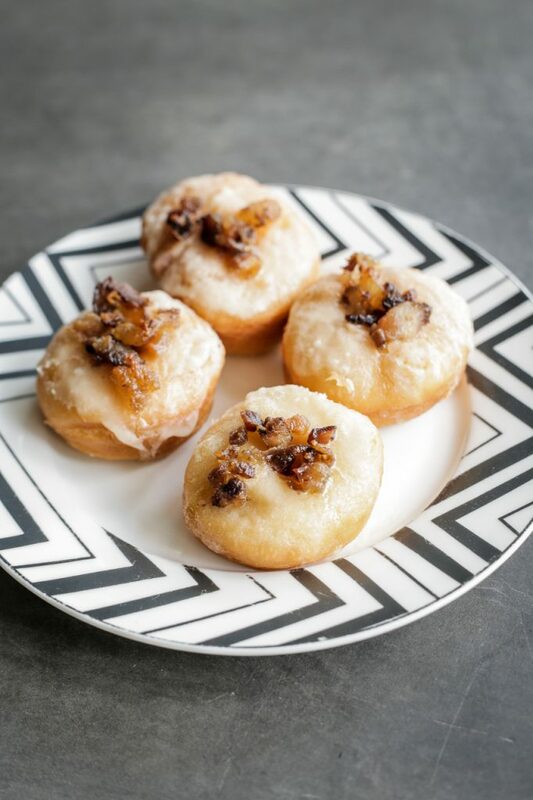 End your meal in 13 Ubay with these melt-in-your-mouth Cupcake Lab donuts topped with Lolo Joe’s Bacon. 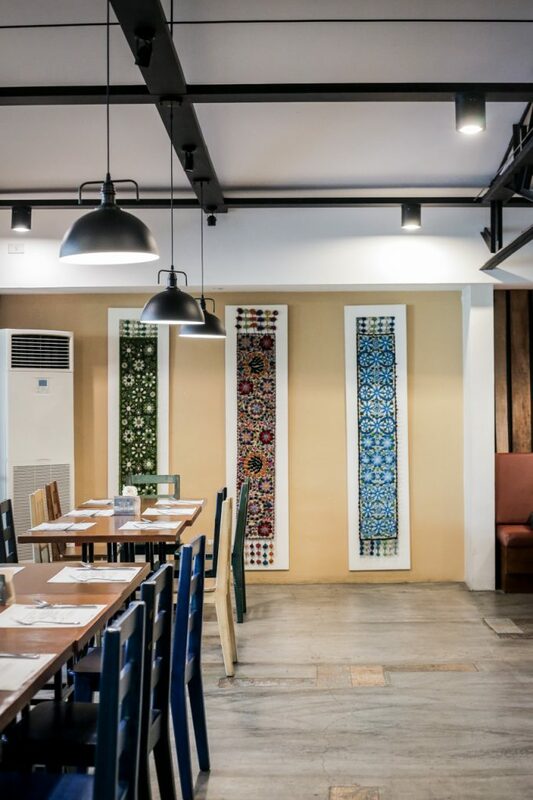 “I want 13 Ubay to be the go-to Filipino restaurant in Banawe,” answers Sarmiento when asked what her new vision is for the restaurant. There are still a lot of surprises in store for customers within the next few months like an in-house brewery, but one thing’s certain: There’s still no Chinese food coming.